I’ve noticed of late that there are many investors choosing to abandon student rental homes and converting them into 2-units and renting them to a nice pair of families. Higher rent and/or the pain of not having to deal with students are valid reasons to do this. However, if you’re successful in renting to students and don’t mind all that comes with it (i.e., permanent ramen noodles stuck on baseboards, beer can pyramids, ruined paint from Bob Marley posters, irrational exuberance to new cannabis laws, etc), then adding a second suite can work. For example, if you can legally carve up 3-4 bedrooms in each unit with its own kitchen (for a total of 6-8 bedrooms and 2 kitchens), then the cash flow may be worth it. You really don’t want to have 8 students sharing 1 kitchen, and you do not want to add in a kitchen illegally. Yes, your neighbours will call the city. And no, hot plates with a microwave probably won’t be considered a proper kitchen. Some cities may not allow you to actually do second suites in certain neighbourhoods that are close to colleges/universities (eg. second suites are not allowed in the Georgian college area of Barrie). Be careful also that you don’t fall into the “rooming house” category if you go down this path. There are various rules in each city, which determine whether a house is considered a rooming lodge. Most commonly, if each room has a door lock on it, then it may be an issue. Please ensure that you follow all the rules for the city that you are working with. Mortgages - Many lenders will not provide a mortgage for student rental. Make sure you are working with one that does. I don’t recommend saying that you are renting to families, and then changing the occupancy to students. This might get you in hot water with the lender. Weed - The new cannabis laws allow people to grow a certain amount of plants in their homes for their own use. You can bet your bottom dollar the chances of this are going to be much higher in student housing. Depending on the quantity, this can cause damage to your property. Be clear about your rules on this. In terms of the renovations for a second suite in a student house, it’s really no different than for a regular tenant. You may wish to hold off on the renovation for the main floor, as long as the place is in fair condition. This is something that you can tackle later on. You probably want to spend most of your resources in the basement suite (assuming it is unfinished) for quality materials. You want it to still be in good condition even when you no longer rent it to students in several years or if you decide to sell the property. This means durable materials such as waterproof flooring, better quality cabinetry, and even a hard surface kitchen counter. The only thing you should have to redo is the paint job. Because you’re likely including the utilities in the rent, you may not want to separate into two electrical meters to save money. I’ve personally never rented to students, so I’m not the best person to discuss strategies on student housing specifically. There are a plethora of online articles, e-books, podcasts from experts that do many of these. My objective here is simply to put student housing into the context of second suites. 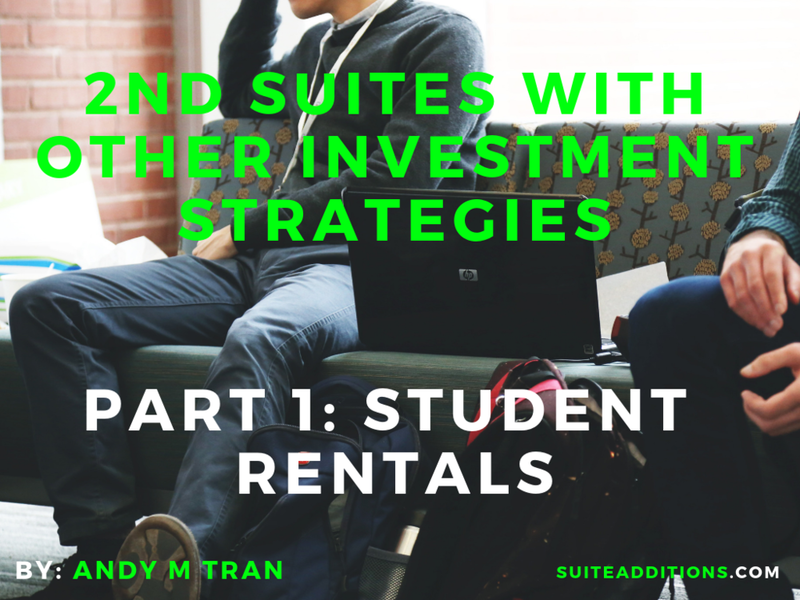 If you are having success with student housing, then second suites may be a good compliment to the strategy in order to have more students in the house, and thereby boosting your cash flow.